“It’s The Most Wonderful Time of The Year” is a song that you will soon be hearing quite frequently. However, in the Southwest part of the USA it can have a different meaning when it comes to serious pickleball players. This is especially true in the states of Arizona and Utah where some of the largest pickleball tournaments of the season are held. A couple of the major tournaments are the Huntsman Senior Games in Utah and the USAPA National Tournament VI held in Buckeye, Arizona. A couple of residents of Robson Ranch and Pickleball Club members managed to come away with some pretty heavy “hardware” for their excellent play in each of the aforementioned two tournaments. Larry Kraus and his partner Carol Lindow picked up a Bronze medal at the Huntsman Games in the Mixed Doubles 60-64 A Division. This is Larry’s second year in a row winning a medal at the Huntsman tournament, winning a Gold last year. Al Hager and his partner Patrick Kane won the Gold medal at the National USAPA tournament held earlier in November. Al competed in the Men’s Doubles 60+ in picking up the Gold. Al also won a medal at Huntsman last year. Great job both Al and Larry, you make great pickleball champs, and we’re proud to have you as our friends and neighbors! 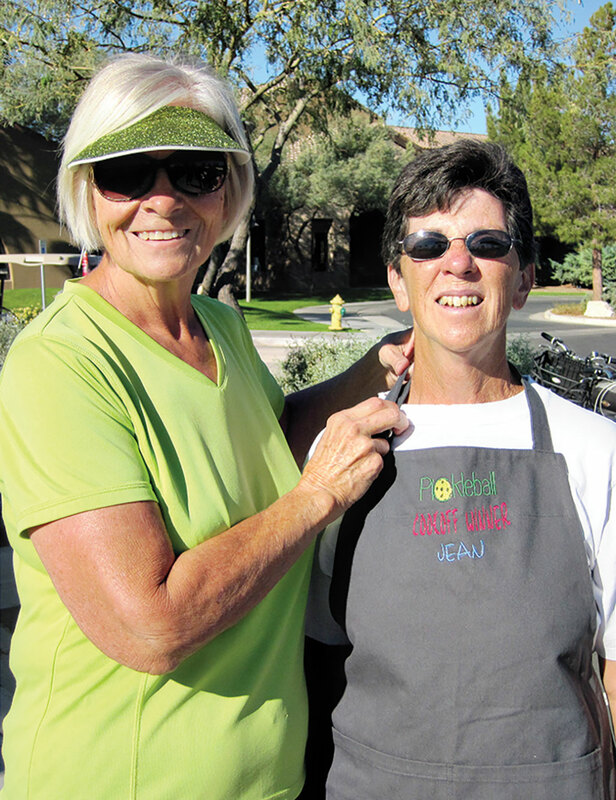 On a more local note, Brenda Amans and Sue Sherwood won a Gold medal in the Women’s 3.0 Doubles at Trilogy at Vistancia tournament in Peoria, AZ. Great job, ladies! In tournaments a little farther from home, members from Canada, Dianne Dunsford and Nina Constable, won a Gold medal at the Manitoba 55+ games and a Silver medal at the Canadian Provincial 55+ games in Edmonton, Alberta, Canada. Speaking of winners, there were a couple of winners at the general membership meeting October 24. 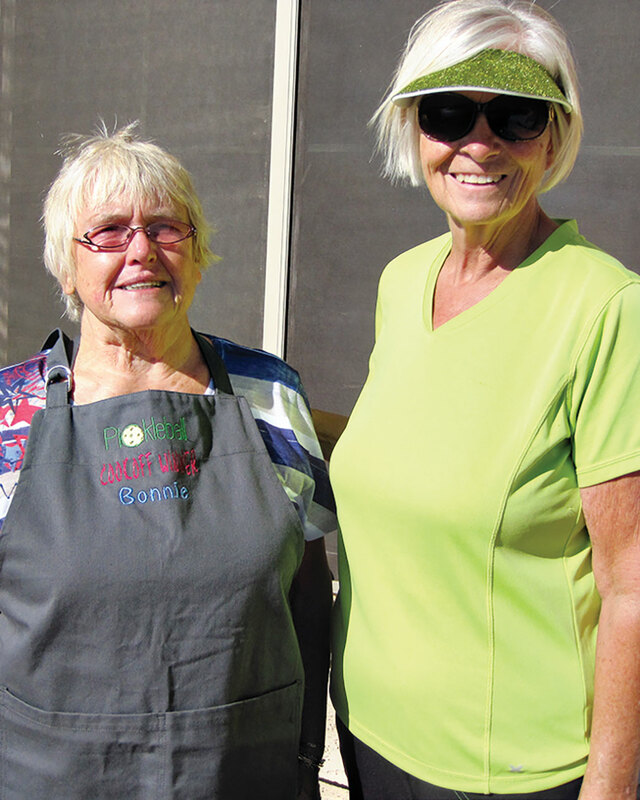 Besides their skills in pickleball, these two ladies came out on top of the crowd in the “Best in Class” potato salad and baked beans contest. Bonnie Pixley was best in class of the six submitted potato salad dishes, and Jean DeChristopher was best in class of the 12 submitted baked bean dishes. The winners were determined by a vote of all the members. There was not a loser among any of the dishes submitted as the voting was close in both categories. Plus, no one went away hungry with all the great dishes provided. Thanks to all the participants and to the Social Committee: Paula Steger, Brenda Amans, Sandi Feller and MJ Wong for such a “filling and fulfilling” event. A special “shout-out” goes to Veronica Long for such a beautiful job with needlepoint decorations for the winners’ prizes, which were beautifully decorated aprons. Congratulations to the candidates for next year’s officers and Board. They are VP, Chuck Bonesteel and Jim Duran; Treasurer, Helen Forbush and Sue Sherwood; Board member at Large, Dave Amans and Bob Burton. The 2015 officers and board member will be determined at the November 23 election meeting.